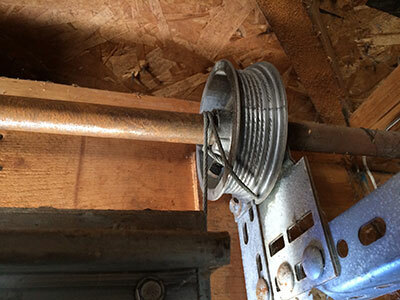 The garage door spring system cannot work without the lift cables. They connect the system to the door. In case of a torsion spring, they go over the drums at the end of the spring shaft and are attached to the bottom end of the unit. When the spring unwinds during door opening, it transfers power to the cables so that they can facilitate the lifting of the unit. But what if one of these components is in poor condition or broke? Learn how to tell and deal with cable issues whenever they arise. It is worth noting that the lift cables are made of strong galvanized steel wire so you should expect them to have a fairly long useful life. Still, they are subject to great tension when the door is closed and do hard work during opening. That is why they are prone to fraying. You can tell if a cable is frayed just by looking at it. Another common sign of this problem is the door making scraping sounds during opening and closing. Cable replacement is the only solution. It is worth noting that these hardware parts can also get small cuts which increase the risk of them breaking immensely. Cuts usually occur due to imperfections on the surface of the drums. They may not be so obvious to notice so you have to give the cables careful inspection during maintenance. If you spot cuts, the best thing to do will be to get a new cable. When this problem occurs, the door will be uneven. It may also get jammed. In some cases, it may go off track. The solution is to get a new cable installed as soon as possible. If the other cable is in good condition, there will be no need for replacing it too. In case the door has got off track, track repair may be required in addition to cable changing and door adjustment. What If the Cable Is off the Drum? This actually indicates a broken spring. When this component breaks the tension which it holds is released immediately. This kind of force can literally push a cable off the drum. The solution involves spring replacement and adjustment of the cable. There is no need for replacing this hardware part too, unless it is damaged or snapped, of course. The important thing is for you to stay put until you get a new spring. Trying to adjust the cable or to lift the door can only make things a lot worse. Be reasonable and careful.